FIERCE DISCUSSION HAS been taking place about gender balance in Irish radio, after it emerged this month that two of the country’s most high-profile stations, Today FM and Newstalk (part of the Communicorp stable), do not have any women on air during peak listening times of 7am – 7pm. When TheJournal.ie attempted to find out from some stations what they are doing about gender balance on air, only RTÉ and Radio Nova replied with answers. Today FM sent in an in-depth statement, which it retracted three days later, while Newstalk and Dublin’s 98FM would not comment. This week, Communications Minister Denis Naughten told TheJournal.ie that he wouldn’t be opposed to the introduction of gender quotas on Irish radio, admitting that he had changed his mind about quotas in politics. Much of the discussion around gender balance has centred on changes at the station Newstalk. On 17 August, Newstalk announced it was to replace the two presenters of its drivetime show, Sarah McInerney and Chris O’Donoghue, with one man, former politician Ivan Yates. This move left no female presenters on the station between the hours of 7am to 7pm. Then came the announcement yesterday that McInerney had been given a new current affairs and politics-led radio show on a Saturday morning for one hour (8am – 9am), while O’Donoghue was named Group Political Editor for Today FM and Newstalk. This was to fill the role left after the departure of Gavan Reilly, who was political editor for Today FM and briefly for Newstalk, to TV3. O’Donoghue was also given a two-hour current affairs show on Newstalk from 11am each Sunday. McInerney’s name had been mentioned as a potential replacement for Vincent Browne after he left his TV3 show Tonight With Vincent Browne, but he looks set to be replaced by Today FM’s Matt Cooper and the aforementioned Ivan Yates. Her new 8am-9am radio slot on a Saturday morning had been occupied by Sarah Carey’s show Talking Point. Newstalk has not giving any update about Carey’s future role at the station. If Carey is not given another show, then this means Newstalk’s gender balance remains the same since 17 August, with women only appearing during off-peak hours. I don’t see myself as a woman in the media, I see myself as a person working in the media and I always have done. I think it’s great that there are going to be two women as anchors on prime time radio shows on Newstalk – but I don’t really see it as a woman thing. I just see it as a person thing. The second woman was Colette Fitzpatrick, who left for a role in TV3 in early 2017. The situation has been garnering much comment of late, forming part of a wider discussion about gender balance and the pay gap in broadcasting which emerged after the BBC released the names of its top-paid presenters. In order to see what is happening on the ground regarding gender balance in the radio world TheJournal.ie sent a short questionnaire to a number of Ireland’s biggest stations. Two Communicorp stations – Newstalk and 98FM – did not reply. A third, Today FM sent a lengthy reply to all of our questions, but then retracted this statement, asking for it to be replaced with the words “no comment”, three days later. The answers from RTÉ and Radio Nova are at the bottom of this article. Earlier this month, DailyEdge.ie looked at how Ireland’s radio stations fare on the gender balance issue during peak listening hours (7am – 7pm, Monday to Friday) and how many women are on air. There are also no women presenters from 7am – 7pm Monday to Friday on Classic Hits 4FM. RTÉ Lyric FM has one woman on air during these hours, the presenter Liz Nolan. The one station that bucks the trend is RTÉ Raidío na Gaeltachta, which has eight female presenters on air during the week. It must, of course, be noted that there are women presenters broadcasting outside of the peak hours, including mornings, evenings and weekends on Irish stations. There are also many women working in the production, research and management arenas in Irish radio. But when it comes to hearing women’s voices on air during the times when radio is most listened to, female voices are literally absent from some high-profile stations, or in a clear minority on others. Back in 2015, a report called Hearing Women’s Voices? was published by the National Women’s Council and DCU’S Institute for Future Media and Journalism. It found that current affairs programmes had a poor representation of women presenters and guests, and there were overall much fewer women’s voices in comparison to men. Orla O’Connor of the Irish Women’s Council told TheJournal.ie that little has changed since. O’Connor said that Newstalk in particular is “going backwards”, and that overall the dearth of women on air during peak hours on Irish radio “is sending out a message that certain areas, certain sectors are more for men than for women which is absolutely the wrong message to be saying”. She said that there “are plenty of women out there who are skilled who have the experience to present – it’s not that there is a dearth of women”. She said that the Broadcasting Association of Ireland (BAI) “needs to put a lot more pressure on the stations” over the issue. O’Connor also said that though she welcomed BAI work on the issue, “clearly there needs to be some kind of sanction on stations because it isn’t acceptable”. What can the Minister of Communications do on this? I do think this is a situation that isn’t just solving itself naturally and solving out of goodwill, it is not happening, because we need to take more proactive steps. Michael O’Keefe of the BAI said the organisation has a number of initiatives to address gender imbalance and diversity, many of which were outlined in its strategy statement which was released in February. On the regulatory side of things, O’Keefe said that the BAI has developed a broadcast return that requires stations to send in information on gender in relation to management and staffing. He also said that the BAI is “working with some of the broadcasters and independent production companies to change some attitudes in areas where there are weaknesses”. What the BAI can’t do, however, is direct commercial stations such as Newstalk or Today FM to put a certain percentage of female presenters on air. With regard to quotas, O’Keefe said that “setting quotas for who your presenter should be, or just the principle of telling stations that you must have a certain number of presenters, it’s not something we have done up till now, but I have no doubt that the issue will arise as we get more information and more research”. Going down the road where you are directing stations to employ certain presenters, that’s a tricky area – they will argue we stand or fall on our ratings and we can’t have our hands tied by the regulator, and it’s a tricky one. Some change may be on its way. The BAI and Minister Naughten’s department are currently awaiting the results of research undertaken by Dr Kevin Rafter on gender and broadcasting in Ireland. Minister Naughten told TheJournal.ie that should this report recommend introducing gender quotas, he would be open to the idea. 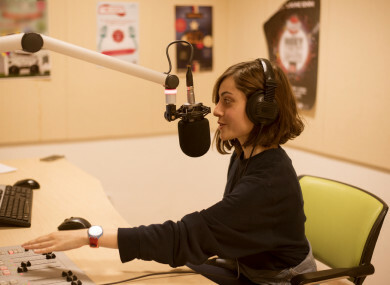 But for now, it’s unclear if the commercial stations who don’t have female presenters on air during peak weekday hours have plans to tackle the gender imbalance themselves. What is clear, however, is that questions will continue to be asked by listeners – and government ministers – about the situation. Would not supply a comment. Did not reply by time of publishing. Do you keep statistics on the gender balance of presenters at your station (RTÉ Radio 1/2FM/Lyric/RnaG)? The schedules are a clear statement of the gender breakdown per service. RTÉ Radio 1 is a clear leader in terms of gender balance on air; the gender mix is 50/50 on 2fm and Lyric fm; the majority of presenters on RnaG are female. Do you have any specific guidelines regarding gender and equality at your station? Gender balance on air is a very important consideration, as evidenced by the above; there are a range of factors that influence the choice of presenters. See answer to question 1 and 2 above. Do you have any general comment to make regarding gender balance and your radio station? No. We’ll leave that to you and the listeners to make that assessment. Is there a long-term aim at Radio Nova to achieve gender balance regarding presenters on the station, particularly during the hours 7am – 7pm Monday – Friday? We certainly would be much closer to gender balance than most stations. Presently our morning news shift (6am-1pm) is presented by a female. Our shows from 7pm to Midnite are presented by Dee Woods and Lisa Kernon. And we always use Dee Woods for our holiday cover. We have also just announced the arrival of Ruth Scott. I don’t see gender, I see talent. I don’t believe we need to as it is not an issue. Our promotions/Marketing executive is female, or head of Finance is female. We have six newsreaders working across our stations, 4 are female. We have a team of seven in our sales room, 4 are female. Do you keep statistics on the gender balance of presenters at your station? Gender balance needs to exist where there is a clear sense of male preference in a radio station. That is not the case in Radio Nova and has never been the case in any Radio Station I managed. What are your thoughts on this issue? Tell us in the comments below. Email “'You won't hear a woman's voice, and it's not acceptable': What are Irish radio stations doing about gender balance?”. Feedback on “'You won't hear a woman's voice, and it's not acceptable': What are Irish radio stations doing about gender balance?”.